The pieces by a famous Ukrainian composer Viktor Vlasov represented here are quire recent, but they already became repertoire ones. There were two main reasons for this. 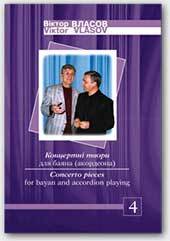 The first is that both of the pieces were obligatory at prestigious in Ukraine accordion players contests. "Improvisation and toccata on theme AACE" on Kryvbas Cup-2001, and "Concerto triptych" on contest named after Voyevodins dynasty (Lugansk 2002). The second reason to draw performers' attention to these pieces was that they both are connected to names of outstanding bayan players. Besides, this connection appears to be an old good method have been used by a classic, when initial or full composition of letters in a name or surname makes its theme (or its core). and the name of his father. It was A. A. Semeshko to whom contest "Kryvbas Cup" appreciate its existence". Analogously, names of the founders of dynasty Viktor Ivanovich Voyevodin, his sons Vyacheslav and Yuriy were used in the thematic of Voyevodin triptych. One must note, not only the Roman alphabet was used, but the Cyrillic alphabet also. The both pieces appears to be the music which can be expressed only through bayan playing. The range of its expression is great here, it embraces pathetic moving of soul, and irrepressible pressure as well as volition and virtuosity. These pieces were first performed by a famous Ukrainian bayan player Volodymyr Murza.